Why does the religious right love adulterous politicians? Here’s who you would think would be the ideal candidate for voters who proclaim personal morality as their driving principle: A man who is faithful to and clearly in love with his wife, who has only been married once, who is a devoted father, who is deeply religious but doesn’t brag about it, who is measured in his language and avoids vulgarity. The problem for conservative evangelicals is that the politician who fits this description is Barack Obama. As for the Republican field, well, that’s another story. Yet the fact that the religious right can’t credit Obama for living the type of morally upright life that it purports to promote underscores just how severed its principles are from its politics. In fact, for a group that expects its leaders to live up to Biblical values, the religious right sure doesn’t seem all that keen on monogamy. Donald Trump was carrying on with Marla Maples while still married to Ivana. There are plenty of other rumors of extra-marital flings, which Trump doesn’t exactly deny. The National Enquirer has accused Ted Cruz of having five mistresses. (Thanks, Enquirer, for that particular image, which we could live without.) Of course, it just so happens that Donald Trump is a close friend of the magazine. John Kasich divorced his first wife and is now on his second. Most people wouldn’t care, but divorce is still a personal failing for conservative evangelicals. Newt Gingrich, the former Speaker of the House and 2012 GOP presidential candidate, who was having an affair with his next wife while still married to the previous one. Not once but twice, mind you. Mark Sanford, the one-time governor of South Carolina who disappeared for six days while carrying on with Argentinian woman. Sanford’s spokesman famously explained his boss’s absence by saying he was hiking the Appalachians. David Vitter, the former Senator from Louisiana, whose name appeared on a list of clients for a prostitution service in D.C. There are plenty of other examples, right up to today. The antigay governor of Alabama Robert Bentley is dealing with accusations that he was having an affair with a top aide despite the fact that Bentley looks like a spokesmodel for Poligrip. Now evangelicals are all about forgiveness, so they will gladly overlook what the rest of us would call hypocrisy if it comports with their world view. 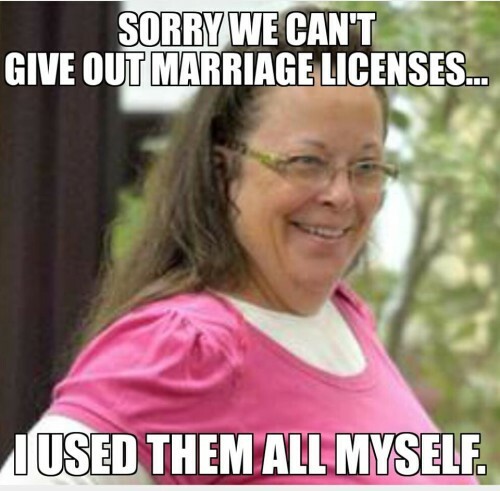 (How else would Kim Davis be taken seriously?) So what if the leading candidate for the Republican nomination talks trashy about women and owns casinos, as long as he holds the right positions? This line of turning a blind eye dates back to Ronald Reagan, who was divorced at a time when that was much more shocking and who apparently married his Nancy when she was already three months pregnant. But the irony is that the man conservative Christians hate the most is the most moral politician in the pack when it comes to personal integrity. Barack Obama is faithful and clearly in love with this wife and the first couple are raising two amazing kids. Yet the religious right treats Obama as completely devoid of any morals and, at the fringes, declares he’s Satan’s tool. The Obama’s have a marriage of equals, and one that many couples would envy. Yet Obama has no authority among the religious right because he’s the man who paved the way for marriage equality. His political positions void his personal attributes, much the way that sleazy Republican candidates’ positions void their personal failings. So what we’re stuck with as a significant portion of the electorate that gleefully touts morality as the foundation of all policy while happily turning a blind eye to the behavior that violates the same morality that its selling. Don’t expect that to change in the 2016 election. In fact, we should expect to hear why Trump’s shenanigans are the equivalent of Hillary’s standing by Bill during his sexual escapades. It sounds nice to say both sides do it–especially when you know it’s not true.